Enter to win a Spring Skincare Pack and $100 Shopping Spree at beautystoredepot.com! Are you ready for spring? You could get your beauty routine spring ready if you’re the lucky winner of the beautystoredepot’s Spring Sweepstakes! 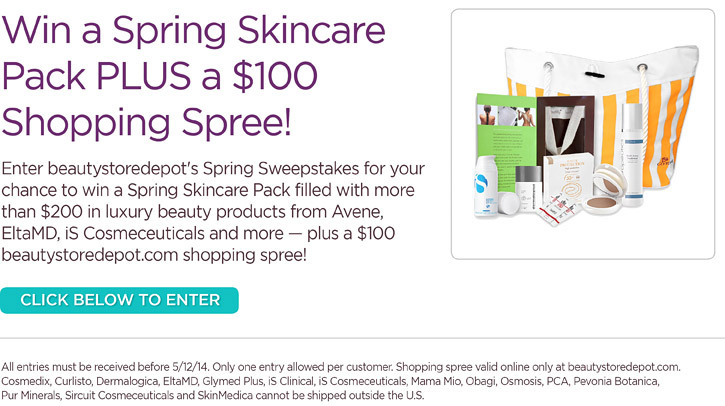 This is your chance to WIN a Spring Skincare Pack filled with over $200 in luxury beauty products from Avene, Dermalogica, EltaMD, glotherapeutics, glytone, iS Cosmeceuticals and more — plus a $100 beautystoredepot.com shopping spree! Enter the beautystoredepot.com Spring Sweepstakes now! This entry was posted in Giveaway, Skin Care on March 12, 2014 by Chrysa. Pick me please! thanks for this awesome giveaway! connie d.